Art lessons, anyone? Colonial Beach has a thriving painters community. There's a monthly 2nd Friday Art Walk to showcase their works to the public, as well as a yearly Potomac River Regional Art Show and Sale (in it's 10th year!) and who can forget the annual Boardwalk Arts & Crafts Fair which has been taking place in Colonial Beach for more than 45 years! With such great resources available, naturally this area is a great place to hold some art lessons. Come and join in the fun, and try your hand at this. One great place is the Jarrett Thor Fine Arts Gallery, which frequently hosts watercolor and oil painting workshops, taught by the top people in their fields. The Colonial Beach Artist's Guild also sponsors some fun, hands-on and educational events in town where you can learn a new skill, or fine-tune the one you've already got. Do you play any musical instruments? Would you like to learn how? Just contact these folks and you can be "tickling the ivories" (that's slang for playing piano) in no time. 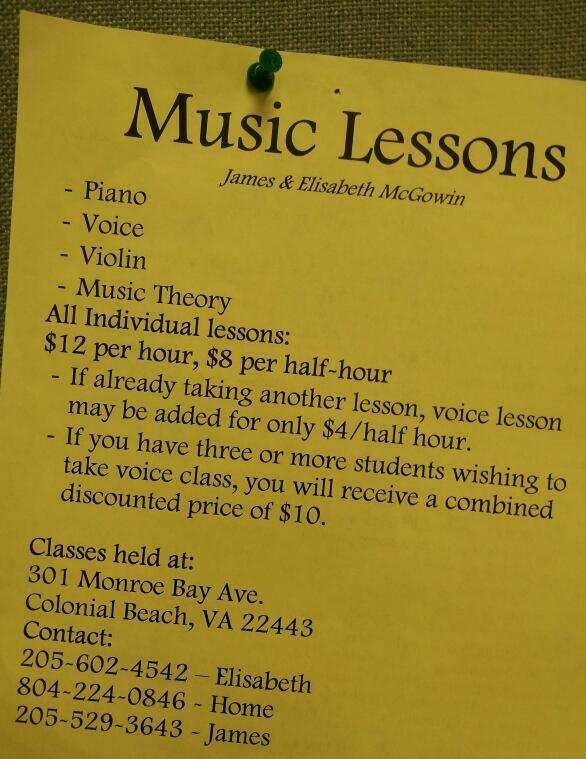 They also offer violin and voice instruction! Interested in taking up pottery? Learn from Hannah Janney at Pottery By Hand on Hawthorn Street. While the shop is now closed, Hannah has graciously offered to return to the beach occasionally to help others learn her craft. Ever wanted to learn to speak a foreign language? French Lessons are offered right here in town. This is one of the most romantic languages ever! Stratford Hall Plantation often offers workshops with topics like Yoga, Rain Barrel Making, Wreath Making and more. Caitlin Davis, a Culinary Institute graduate and owner of The Tides Inn Market has been known to offer cooking classes. Keep an eye on the events calendar for information on upcoming workshops and classes.